As a lover of tea and the art of taking tea, it was thrilling to visit an actual tea plantation where the tea is grown. On the tour, we learned a lot about the tea plant and growing and harvesting tea! 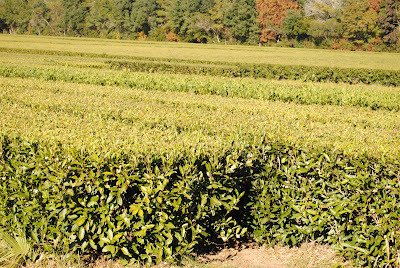 Acres and acres of tea plants -- camellia sinensis -- a cousin to the familiar camellia plant that graces southern gardens. 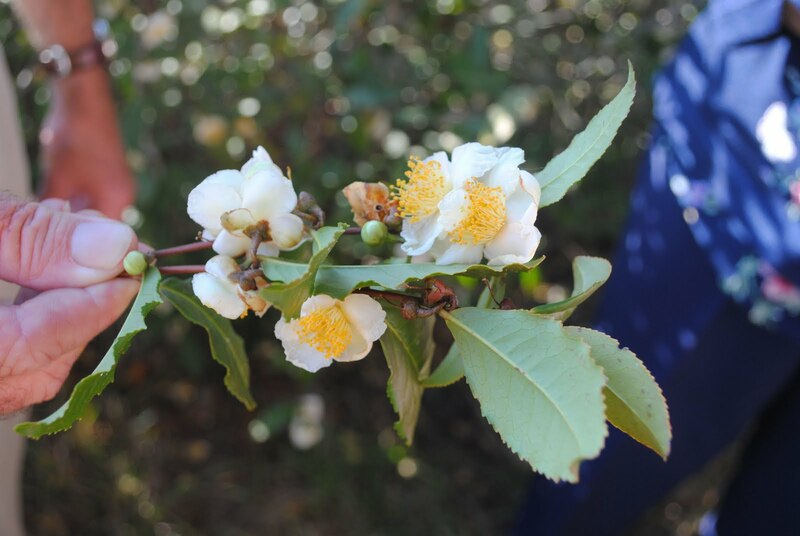 The tea had been harvested and the plants were starting to bloom. Not big blooms like their garden cousins and not as fragrant either -- but they did have an aroma and I can imagine the plantation at the height of blooming -- it must be heady both in beauty and in aroma! I've ordered tea from the Plantation before -- it is good tea and it is nice to drink an American tea. 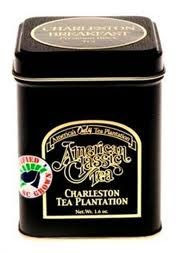 Of course, on a trip to the plantation, what came home with me . . . .
Tins and tins of American Classic Tea! It's a good tea and one that I do enjoy. 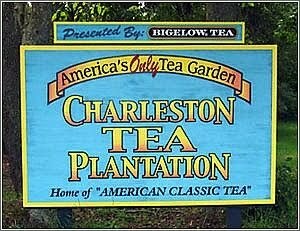 I had not ordered it for a while and the visit to the Plantation reminded me just how good "America's Own" tea was! It's now partnered with Bigelow and so distribution is wider than it once was -- often you can find it wherever Bigelow products are sold. But if it say's "American Classic Tea" -- it was raised and harvested and processed at the Charleston Tea Plantation. They made that abundantly clear on the tour. And today at half past three, my tea of choice was the American Classic Tea which I enjoyed with the rest of Andre's cookies! It's Wednesday and time to join Susan at A Southern Daydreamer for Outdoor Wednesday. How interesting. I'd no idea that tea was grown in the US. Did not know that. Happy New Year. Always nice to visit with you. 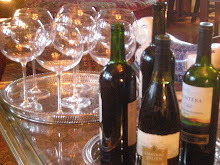 How fun...I think it may be tea time for me. I really enjoy a glass of good ice tea. I am sure I would have loved taking a tour of this tea place. What an interesting post about American Grown Tea! 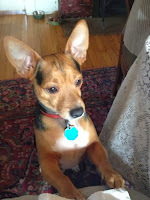 You always enlighten me with your knowledge of all things tea! Thank you for this informative post! We have visited there and have tea from there also. I also purchased a small teapot and 2 cups while there. It is one thing I have kept in my move! 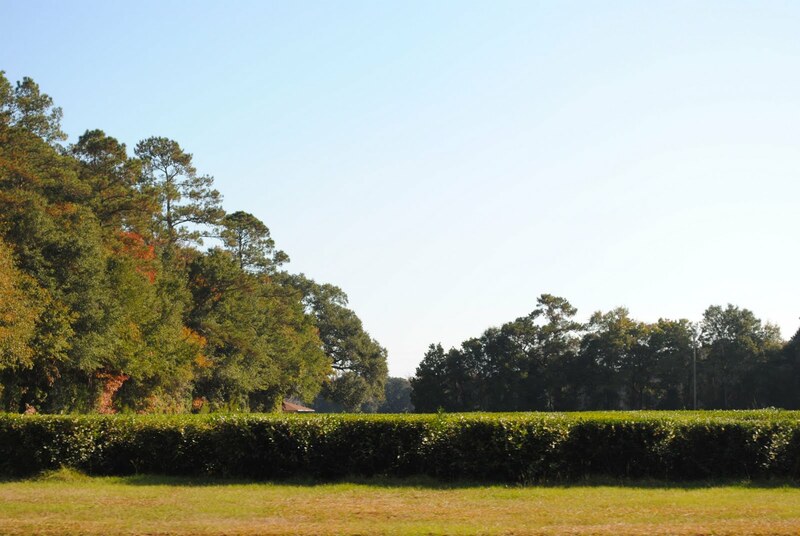 oh...it would've been nice to see that plantation during my Charleston visit years ago. The place looks beautiful! happy new year!! 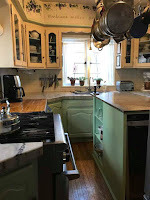 After I'm finished looking at the Outdoor Wednesday posts, I think I will go have a break and make some hot tea. Nice Tea Planation tour. Beautiful photos and I did not know that tea grew in the US at all. I would love to buy that tea, it sounds wonderful!!! I'm glad to know that because we try to "buy American" if we can but it is hard to find our products in the stores. I'll watch for it. Martha, I enjoyed this post. 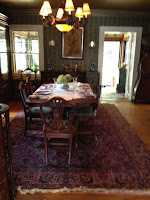 I was in Charleston in 2008 but was not able to get out to the plantation - glad to see it through your eyes.